Genetics may be a difficult concept to master for young adolescents. 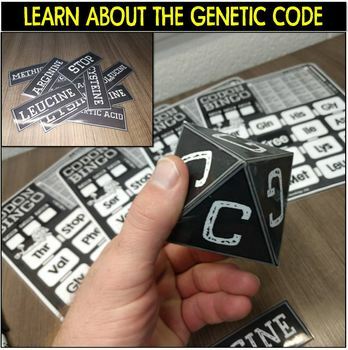 Learning about the genetic code is fairly easy if you understand how to navigate and map the code. A codon is a sequence of 3 nucleotides that code for a single amino acid. 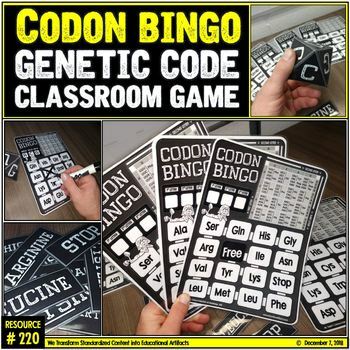 Students will get an immediate grasp learning how to use the genetic code through this one-of-a-kind codon bingo game. 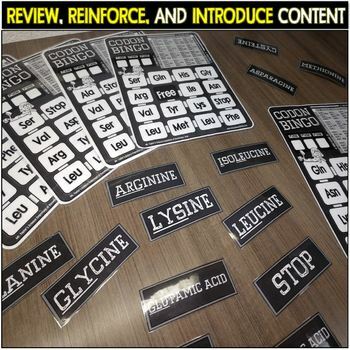 Students will practice this technique through the use of bingo cards with a built-in genetic code. There are two ways to play this game. For the traditional way, there are 20 amino acids cards that can be picked from a hat. However, the fun way is to use the included 8 sided codon dice. The teacher or volunteer will roll the dice three times. Each representing the appropriate nucleotide. 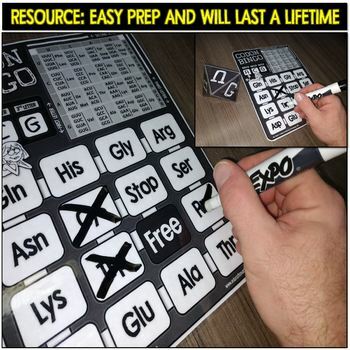 After a codon is rolled, students will use their codon chart to determine which amino acid needs to be crossed off their BINGO board. Play BINGO using 4-in-a-row, inner, and outers.